We live hours away from Chiang Mai and therefore often stay overnight before a flight. 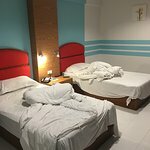 We Briza hotel is one of our favorite choices and we book it when the price is right at that time (depends on demand). The area is OK and for us it really does not make a huge difference - everywhere in Chiang Mai is not too far from the airport and a taxi is almost always the same (about 175 Bath). We stayed there 2 nights. We red so many bad comments on trip advisor about this hotel. When we checked in, it all went good, staff ok but not very welcoming. Room is ok, pretty clean, bathroom is fine (apart the mould on the ceiling), water was draining properly without flooding the bathroom. Breakfast was good, with lots of choice. Not much to complain about but this hotel needs refurbishment and staff don’t speak much English (we almost missed our bus because they didn’t book us a tuk tuk). However, this is a good budget hotel, close to the night bazaar. Hotel is clean, breakfast is good, beds are small but overall it’s fine. The shower was tiny and you have to turn on the Instant hot water heater. Pool is in the lobby which is odd so did not use. The location is a little remote compared to the downtown area but we found a taxi pretty easy and cheap - only 30THB to go where we wanted. The hotel is located about a 20-25 minute walk from the main town centre (which we did not mind the exercise everyday) no real lunch or dinner places nearby unless you walk to the centre. The breakfast was very yummy with tradition Thai dishes, salad and toast (no cereals or yoghurt). The staff are very friendly which definitely made the stay a lot nicer. 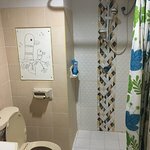 The rooms are fairly basic but what you expect for the price, the only issue would be the shower in the bathroom which does not have a door and the whole bathroom tiles gets soaked and they are VERY slippery so beware lol. It is also quite a noisy hotel however I think this is more due to inconsiderate guests with children running around screaming at ridiculous hours. The pool is also an indoor pool although it says outdoor. Again this is a pretty good hotel considering the price, good for a budget, and we enjoyed ourselves, if you are after something more luxurious it probably isn’t for you. I’m a fairly easy going traveller and tend to abide by the motto “you get what you pay for” so I had fairly low expectations for this hotel but the pictures seemed nice and we booked last minute in haste so didn’t really have time to look into it. Firstly the pictures used give a totally view of what the place is actually like, reception area is beautiful but that doesn’t follow on to the rooms. We had a twin room on the 2nd floor for 4 nights. The only positives to note are the WiFi in the room was good and the beds were comfy, the room itself was fairly clean. The bathroom on the other hand was grim, mouldy, dirty and a shower curtain that makes you think a murderer will slice through it at any given moment. Dangerous too as the ‘wet room’ doesn’t drain properly so is just that, a wet room, no anti-slip mats so you take your life in your own hands showering and hoping not fall and crack your head open, there were also ants. Without a doubt this hotel is literally the nosiest hotel I’ve ever stayed, I’ve stayed in a 24 bed dorm in a hostel that was quieter. This is partially due to lack of consideration from other guests, but I’m convinced the walls must be made of tissue paper because the noise was ridiculous, also staff have radios that I think are loud enough to hear across the continent and they scream down them all he time. They also have this really weird staged seating area on floor 2, so if you do pluck up the courage to stay here-I wouldn’t-avoid floor 2, where they play generic piano music from a stereo system from literally 8:30am to at least 9pm, it inspires a sinister sort of Groundhog Day feel, totally creepy and way too loud. The breakfast was the worst we’ve had I Thailand so far and we’ve been here for nearly a month, no cereals, toast was stale with some sort of spread posing as butter, all manner of cooked items but non breakfast related or labelled so no idea what they were. The rice was nice and there was melon which was fresh, no milk or yoghurt, just a really poor selection. Safe to say because of this we didn’t eat in the restaurant onsite. Now the above might have been bearable if the service and the location were good but sadly not the case. It’s pretty far from the centre, next to fruit market so handy for breakfast but there’s not much else about in terms of restaurants or anything really. We used Grab to get to the centre of town which was cheap enough so not an issue but annoying if you want to pop out for a quick bite to eat. About a 15-20 minute walk from the night market too. Also we were told it had an outdoor pool so thought we could top up our tan and enjoy the sun when it was too hot to explore, but no, the “pool” is indoor and essentially at reception. I’ve never seen a hotel pool like this before, it looks in their photos like a lovely secluded spot but it’s literally next to reception with all guests and staff walking past, there not really anywhere you can sit to dry off either so you have to go back to your room through hotel dripping wet. We’d travelled for quite sometime before arriving at the airport in CM so I contacted the hotel to arrange for them to collect us, 350 baht, not an issue. We landed, 15 minutes passed and no one arrived, I called them and they said I’d not confirmed the booking, but I explained I did and they had all of my details so I don’t know how it wasn’t confirmed, instead we got a taxi only 200 baht, but no apology from the staff on our arrival or over the phone. So we went to check-in, we arrived if we had the landing card from when we arrived, I explained we didn’t as we lost it due to travelling around so much but our passport was stamped with the details anyway. The staff member then got another member of staff who asked us again, again I explained, we were asked about 4 times before we finally showed them the stamp in our passports. The staff were quite rude and very abrupt, something we’ve not experienced anywhere else in Thailand, nor were we asked that anywhere else either. As we couldn’t check-in until 2pm we tried to ask if there was anywhere to eat nearby but again received no help. I understand not everyone can speak English but surely a hotel with multi national guests would be better equipped to help their guests. 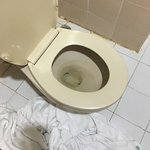 We also tried to ask about late check out due to the time of our flight and we were told it would be 500 baht which was almost a days rate and seemed unreasonable given the quality of the hotel. Overall this was the worst place we stayed during our entire trip, thoroughly disappointing and obviously wouldn’t stay here again it recommend that anyone else does for that matter. I’m sure there are better places for the same sort of price. Breakfast is good, air con is good, staff friendly enough and despite being a little outside town it's still only a 25 minute walk to old town gate. The problem with the hotel is that the walls are made of cardboard and you can hear EVERYTHING, so much noise coming from outside the room in the foyers, sounds like elephants walking a over you, hear every single door closing , really had terrible sleep here so make sure you bring earplugs otherwise you won't sleep.